1. Have enrolled or be willing to enroll in MyOchsner account – Ochsner offers a great way to connect through the online patient portal, MyOchsner, which is free and provides you access to your Ochsner medical record! 2. Smartphone – You must have your own smartphone to participate (either an iPhone or an Android phone such as Samsung, Motorola, HTC, LG, Google Nexus, or Sony). 3. 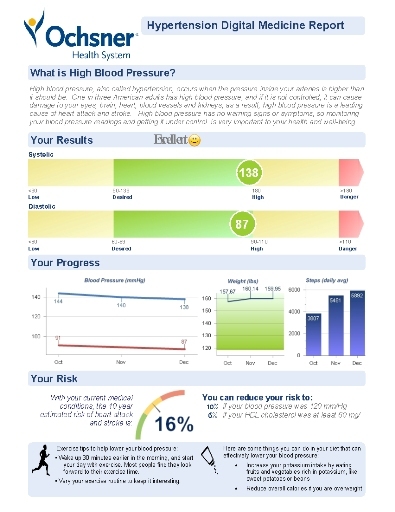 Digital blood pressure cuff – Using this blood pressure cuff that hooks up to your smartphone, you will be able to send in your home blood pressure readings to the Hypertension Digital Medicine Team. We have made arrangements to offer blood pressure cuffs at a discount for our program’s participants. Ochsner has arranged a special 25% discount at Withings for patients enrolled in our program. Use discount code “WITH-OCHSNER”. Any HealthKit enabled digital blood pressure cuff, if you have an iPhone 5 or above. As a patient, you will receive regular feedback from our hypertension care team and monthly reports regarding your progress. See below for a sample report. Your Ochsner physician will also receive regular reports and have full access to your data and our recommendations within your Ochsner electronic medical record.